Yeah, yeah...I know. 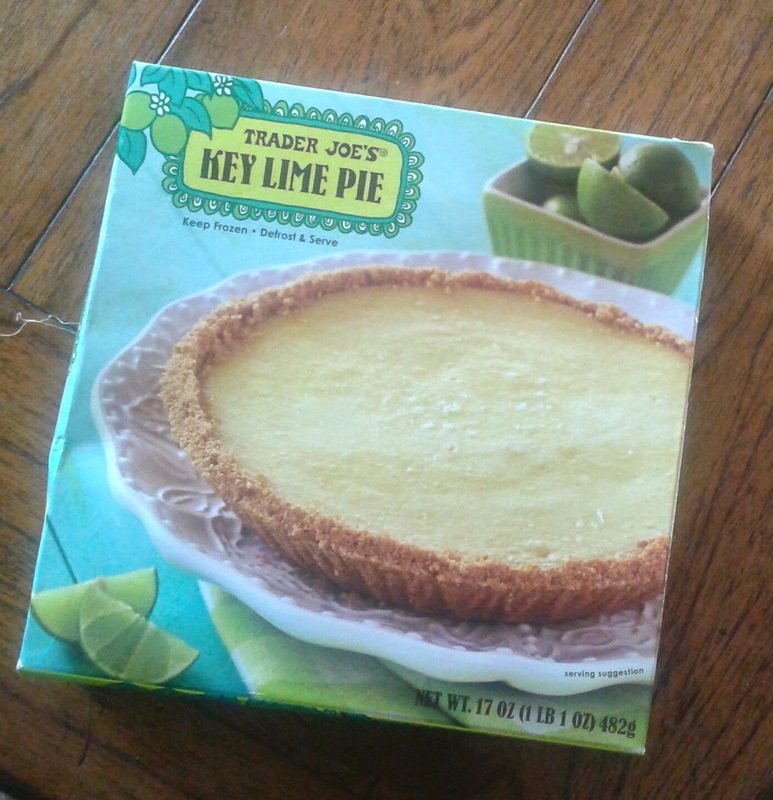 Just a post or two ago, I was talking about the success I've had following a paleo diet over the past few weeks, and now, here it is, at long last due to popular demand, a review of Trader Joe's Key Lime Pie. I'm willing to bet our bigger foreheaded forefathers had some sort of prehistoric lime-type fruit but not the means to make into one heckuva tasty pie, so I'm a bad pseudo-caveman. I'd grunt more vigorously and wave my club in self defense with a little more earnest, but it's not worth it. A little cheat, now and then, isn't the worst thing...especially when your nearly seven-months pregnant wife insists on picking up something...for your birthday...what are you going to say, no? I'm not. Diet's still working, thank you very much. 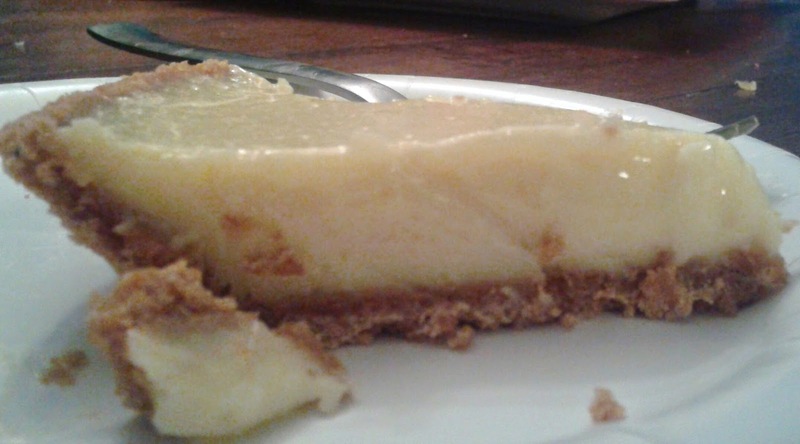 And the great thing is, diet cheat or not, this one heckuva great pie. My goodness. There's so much to like here. First and foremost, this pie resides in the frozen aisle, so it's one of TJ's thaw-and-eat delights. Other desserts in this category have been somewhat hit or miss for texture - a lot of times, even while following or even exceeding thaw specs, there's still that mouthfeel that screams "I WAS FROZEN AND I STILL KINDA AM!!!!" Not so here, oh no. After just an hour and half in the fridge, this pie transmorgified from rockhard icy discus to soft, delectable, inviting citrus pie delight, without any trace of freezer-y-ness. Absolutely perfect. But that's not all. The lime filling struck an impeccably perfect balance between sugary sweetness and citric tartness, all in a soft creamy goodness. Irresistibly good - so satisfying and refreshing altogether. Perfect. And what this even more perfect was the crust - no, I'm serious. I would have been reasonably happy with a run-of-the-mill graham cracker shell and not given much more thought. Instead of that, TJ's went with a gingery crust - not nearly as strongly gingerish as, say, their Triple Ginger Snaps, but still with a good amount of ginger that was a perfect counterbalance to the rest of the pie. 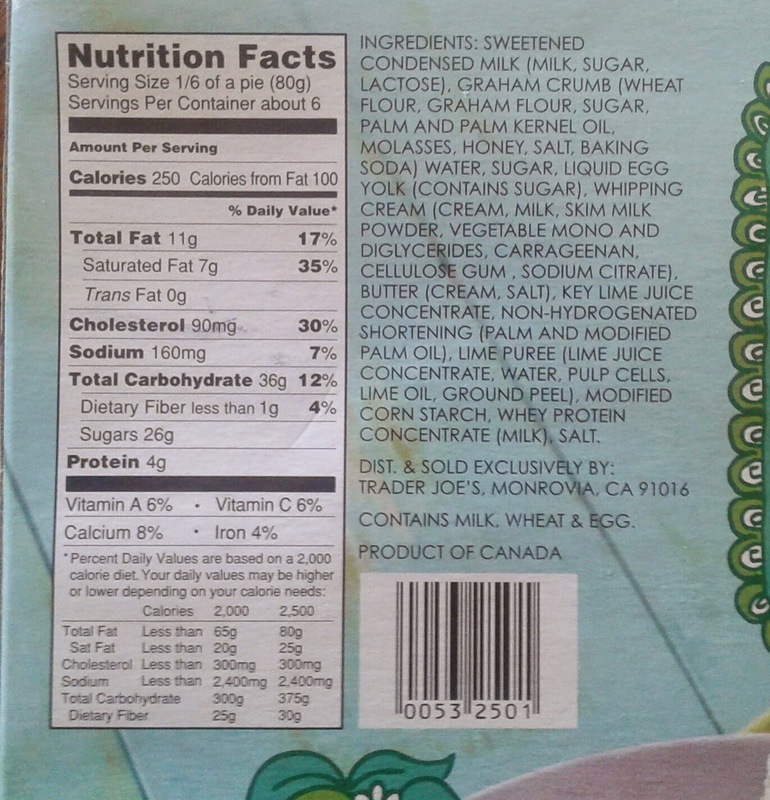 Which is kinda weird, there's no ginger on the ingredients list...eh, whatever, I'll stand by what I said. How good was this? Sandy ate two slices. My brother and his wife (both of whom are fairly diet conscious) ate two slices. I ate two slices. Then we all kinda looked at each other, shrugged with a "That was worth it" expression, and then stared longingly at the empty tin foil plate. I gotta go perfect five on this. Hands down, the key lime pie was the best TJ's product I've had in sometime - yeah, maybe it just seemed extra good because of all the other sweets I've been denying myself recently, but I think it was actually that good. Sandy semi-incredulously went with only a four, noting it needed some cool hwip to really top it off. Maybe that's technically true for some, but then, I'd say, go supply your own while I'm perfectly happy with it just as is. For one night, I was one happy caveman. I agree. I am a big Key lime pie fan. My own recipe is pretty great but of course it's a pain to make. Restaurant versions can be hit or miss and I have never had a store bought Key lime pie that I liked. But I like this one! Both the crust and the filling are great and the price is right at $4.99. Amazing that most restaurants charge the same price for just a slice of pie, which is often so-so or downright bad. wha?? It's seasonal? Gonna get some right away then! I absolutely love this item, we have bought 3 already! You hit the nail on the head all around, fantastic dessert and review! i just found out my trader joe “organic milk” comes from rockview which is being sued and under investigation because its not organic and is a filthy place that waters its grass with sewage. I really want a slice of this pie for breakfast right now. Looks super yummy! The Key Lime Pie is still in TJ freezers, so grab it before they're gone! I missed them last year and yes, the pie is as good as Russ says. I don't have a big sweet tooth but always liked a good klp, and this is an excellent one. One of the best Key Lime pies I have ever had- way better than what I had even at Key West! The best I can buy in my area, only one that comes close to the best one ever I had in Key West Florida.